Justin Hayward Connaher was named after the lead singer of the 1960s rock group, Moody Blues. At age 5, he knew he was going to be a paratrooper. At 38, he knows he’s a survivor. As part of StoryCorps at JBER, Justin spoke with his friend John Pennell about one of his earliest jumps. 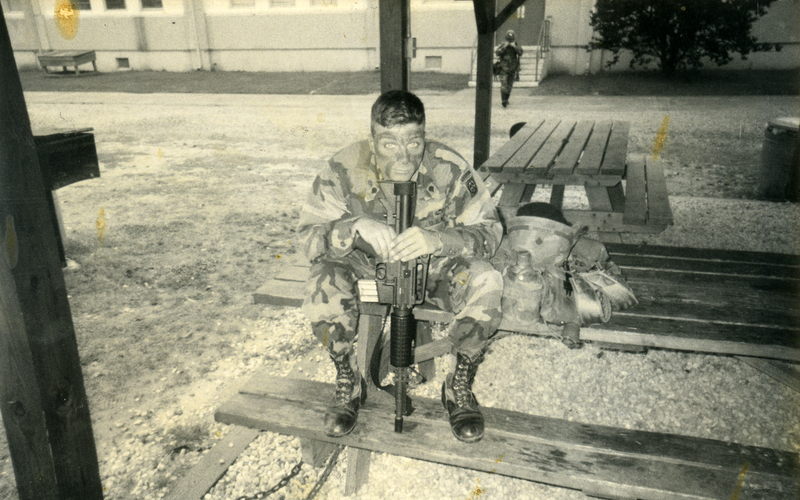 Justin Connaher, a former parachute infantryman in the U.S. Army’s 82nd Airborne Division, is seen at Ft. Bragg, N.C. before a jump in the mid 1990s. “You know, sometimes you think, in your mind, you know the way some things are going to be like. And I had thought about what it would be like almost my entire life, to jump out of an airplane, up until that point. And it was not… anything… like I thought it would be. “This was a night jump. I got to the door. I jumped. Everything was good. I counted to four-thousand. My chute opened. I checked everything over. Everything is good. I’m looking around. It was a nice, moonlit night. I could see other jumpers. I was enjoying the ride. And then I noticed I was falling faster than everybody else. That doesn’t make sense. I’m a small guy. I’m 130 lbs. Even with gear, I could be the first man out the door and I’d be the last one to hit the ground. “I looked up at my chute and it had partially collapsed into a half-cigarette roll. This is very serious. I was losing altitude very quickly and the ground was coming up extremely fast. “I have no recollection of actually hitting the ground. But I do remember a terrible crack. It was probably when my skull was fractured. It hit the inside of my helmet when I hit the ground. From that I have a traumatic brain injury. I was unconscious. When I woke up I couldn’t see or move. I was partially paralyzed. “The recovery process has been very difficult. When I got out of the Army I was in a bad place. My whole identity, up to that point in my life, was ‘I’m going to be a solider’ or ‘I am a soldier’ — and that’s going to be my career until I retire. And that was taken away from me. It’s not someone’s fault. I don’t blame the Army. It just happened. You’ve been listening to StoryCorps with service men and women of Alaska. Justin Connaher’s interview is archived at the Library of Congress. These days Justin works as a photojournalist. His pictures regularly appear in newspapers nationwide. This piece was edited by Bede Trantina at Alaska Public Media.